Just a week ago, garden beds were extremely dry. Not a concern for most of the garden because I knew sooner or later the rains would come and all would be well. I was, however, concerned about beds planted with lettuces and other greens that have already required covering for protection from cold temperatures. If those beds remained dry and severe cold moved in, there would be a greater chance of the plants being damaged by the cold even under two layers of protection. If I had to, I was prepared to use several 5 gallon buckets of reserved rain water. While that will help in a pinch, I know from experience it won’t help like a soaking rain with temperatures in the 40s. Fortunately, that’s just what we’re getting here today. You’ll get the best results from a gentle rain that totally soaks the soil accompanied by temperatures in the 40s that give the plants time to absorb the moisture before the freeze comes. Then when temperatures drop, the water in the plants acts as an insulator against the cold. This picture was taken Nov. 25 and the beds were dry. They are now totally and evenly soaked and ready to offer the best protection to my lettuces. You can see both coverings – the row cover fabric and the plastic already in position to be pulled over the wire frame. The moisture that has been evenly distributed throughout the beds will continue to work for the plants over time. As day time temperatures and some sunshine heat up things under the covers, the moist soil will better retain that heat than dry soil would. This will serve to protect plant roots as well. On warm days when water starts evaporating, the resulting humid air will also retain heat and form another layer of protection for the plants. To get these great results you’ll need to have been working on your soil and have great drainage. If soil doesn’t drain properly and moisture puddles and sits there, your plants will be more susceptible to damage from cold. 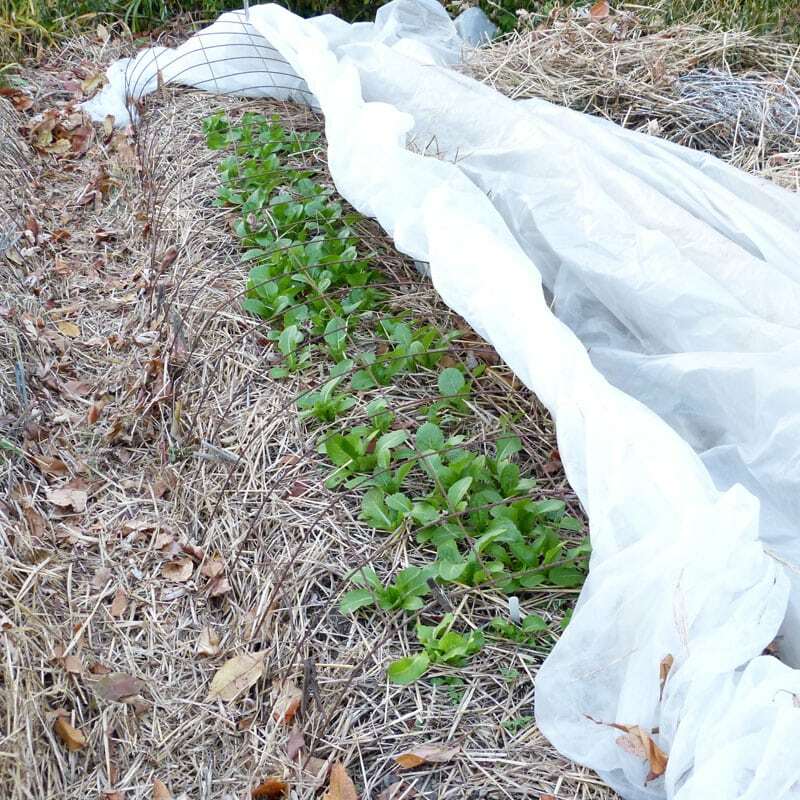 In most areas that experience freezing and bitter cold in winter, there are times that protective coverings have to stay in place over the plants. That can be because of freezing temperatures and/or because ice and snow make it impossible to remove the covers. As soon as conditions allow, open up at least enough of the covering to get the fresh air flowing around the plants. Even one day of good air flow can make a difference in preventing unhealthy conditions. Hope you have an abundance of lettuces growing and that you’ll be able to enjoy them throughout the holidays and cold winter ahead.